The overall design of your kitchen is affected by the things that people first see when they walk into your kitchen. Since cabinets make up a large percentage of the furniture in most kitchens, it is a given that your cabinet doors affect the physical appearance of your kitchen. 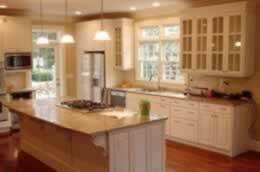 The best way to ensure that you are happy with how your kitchen looks like is by getting your cabinet doors in Sterling Heights, MI fixed by a professional. Since you will spend a large amount of money on the doors, it is best to ensure that they are of a high standard. Only a professional can ensure that you are not disappointed by the end results that you get. Since cabinet doors are exposed to maximum wear and tear, as they have to be pulled and closed and handled a lot in the course of a day, you want to ensure that they are well done to increase their longevity. We will use high quality materials that are durable, as well as easy to clean when designing your Sterling Heights, MI cabinet doors.